A Ghost Recon script pitch is in the works, according to the man in charge of Ubisoft's Motion Pictures Unit. 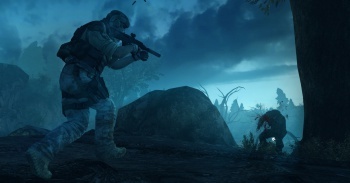 Ubisoft's chief executive of its Motion Pictures Unit, Jean-Julien Baronnet - formerly head of director Luc Besson's EuropaCorp - has been teasing some film projects, among them Ghost Recon. It's Ubisoft's hope that its Motion Pictures Unit will succeed where other gaming properties have failed, and wow gamers and non-gamers alike on the big screen. An Assassin's Creed adaptation starring Michael Fassbender and a Splinter Cell with Tom Hardy in the lead are the first two out of the gate, but Ubisoft also intends to develop other properties. Rayman Raving Rabbids will get a cartoon series, and a Ghost Recon pitch is in the works. "If you look at past adaptations of games to movies," Baronnet says, "none were done by an integrated gaming company that put a movie structure inside of itself." It's that twist, of having the company that makes the games retain creative control, which Ubisoft and Baronnet hopes will make the difference. "With so much at stake, it's important we don't give up the DNA of the game, the fundamental pillars," Baronnet says. "We want to make a movie that will serve the brand," Baronnet says, "and make happy the gamers and also the non-gamers. I think it has never been done before, but we can build this bridge."